At Forpak, we are turning up the energy. You can feel it when walking around our manufacturing plant, see it on the faces of our employees, and hear it in the voices of our customers around the world. Turning up the energy means growing our abilities, expanding our capabilities, and deepening our commitment to continuous learning, constant improvement, best-in-industry quality, and excellent customer service. Transfer your product from the cooler or freezer. Quality-check product using our vision/reject system and/or metal detection. Stack product to specified counts. 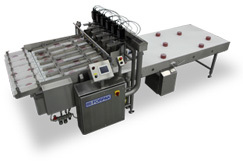 Transfer product to downstream packaging, such as flow wrappers, baggers, and manual case packing. Our customers are unique and so are their projects. Our goal is to understand and incorporate each customer’s driving factors in packaging automation and quality control. We work with you and your suppliers to create seamless solutions that provide an efficient and significant return on investment. Your project will have a dedicated single point of contact who liaises between your company and our engineering/design teams and skilled tradesmen. Discover how Forpak’s experience, expertise, and energy can deliver unique and effective solutions for you.